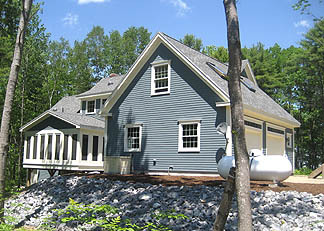 The exterior of this private residence uses Hardiboard cement clapboard siding with "Color-Plus" paint system for a durable, care-free siding. 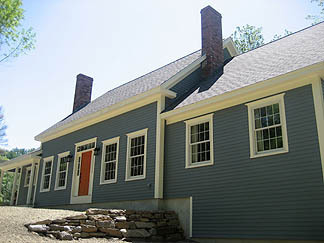 The paired chimneys vent the two fireplaces, a wood stove and furnace. The wall to ceiling brickwork fireplaces are located back to back in the living room and bedroom. This view reveals the privacy of the three-season sunroom. Also note the automatic start generator. 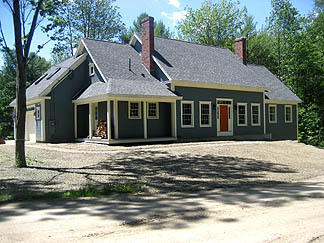 Residents frequently encounter power outages on rural side roads such as where this house is located. 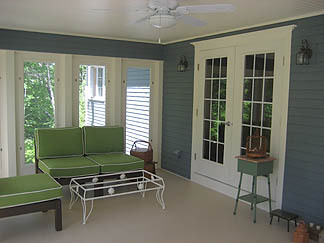 The interior of the sun-room with french doors to dining. There is a separate entrance from the kitchen. Beadboard ceiling and pine floor lend a rustic feel. Silestone countertop provides a breakfast peninsula. 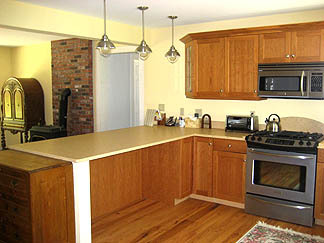 Cherry cabinets with decorative molding finish the top.